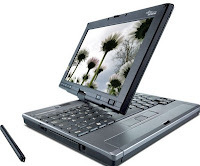 Daniel B's Tech Blog: Is this the Year of the Tablet PC? For years now, Microsoft has been trying hard to make popular the Tablet PC, but will this be the year that the Tablet PC is finally made mainstream? And will Microsoft be the one to pull it off? I think both Yes and No to these questions and here's why. Ever since the release of Microsoft's Windows XP Tablet Edition (originally released in Novermber 2002), Microsoft has been pushing the mobile PC market expecially to those devices using the famous Stylus.However, this device hasn't been accepted into the mainstream market but does have it's niche markets (i.e. students, medical professionals) with specialised needs that are met with a tablet PC (i.e. digital note-taking) that are hindered with the standard laptop/mobile computers. But is this the year that this trend changes? There has been increasing speculation that Apple Inc. will be releasing their first table PC device (gossip predicts it to be titled the Apple iSlate)with word that the device will be revolutionary to the industry. Since the release and ever-increasing success of the Apple iPhone 3G series, there has been hope that Apple will release a larger version of the iPhone (minus the phone function). With this speculated device expected to be showcased some time this year, the table PC may actually become mainstream. So what has Apple done to make this device popular that Microsoft couldn't? Although on a basic level, Apple's & Microsoft's tablets are the same; touchscreen, mobile/wireless etc. Apple will actually "reinvent the wheel" using the iPhone model, hence helping it to succeed more than Microsoft's intended design. Apple's apprent iSlate, as mentioned before will actually be a bigger iPhone. It will be available to the all famous App Store along with the reknowned refind hardware and operating system. Microsoft's issue is that they never had control over anything but the operating system. When you look at the current designs and layouts of the Windows-based Tablet PCs they are more or less standard laptops where the LCD display can be repositioned into a tablet-like state. Ending up with large, heavy and bulky slab. More specifically designed models that actually ARE tablet PCs still remain heavy and awkward, all of which are out of Microsoft's control. On the software side, the Windows-based tablet does come with some specially designed software but not comparable to the offerings of Apple App Store. In order for Microsoft to hacve had seized this niche market, they would have need to not only made the software and become more or less proprietory and make the hardware to go with the operating system. In the last decade we have seen the success of devices tht have been design all by a single creator; the Apple iPhone/iPod, XBOX360 for example. Had Microsoft designed the tablet entirely and made it proprietory we might have seen a greater success for this device. So with the prediction of Apple's tablet release and then most recent news of a possible Google Chrome tablet PC this is definitely the year of the tablet. But the ever high design expectation, Microsoft will not be owning this market. There hasn't been a PC maker yet that has been able to produce a market changing Windows-based tablet PC. We will, although see plenty of copycat devices, jut like all the "iPhone-killers" on the market, but nothing has yet to compare to Apple's design or impress/revolutionise the market.